Gwen Little has earned her certification as a CPDT-KA. This is an international accreditation program recognizing sound dog training principles and the choice to adhere to a Code of Ethics with a commitment to continuing education. She holds a certification in Pet First Aid. She also has a BSc. in economics and is an honours graduate of Animal Behaviour College. 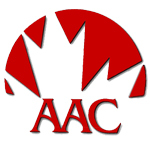 To enhance her education with ABC College she mentored under Sharon Worsley for several years. Continuing education is a strong personal mandate of Gwen's. It is important to her to be current and relevant with science based methodologies of canine training. She attends educational conferences and continues to take follow up courses through Animal Behavior College. Gwen prides herself in the science based method of training which employs positive reinforcement methods. It is the most humane, kind and fun way to train a dog and any other species. This method of training has the added bonus of deepening and strengthening the canine-human bond. Gwen hosts educational/information seminars monthly for new puppy owners at PetValu / Pet Supply Warehouse in Peterborough and has written several articles for Freedom and The Old West End magazines. She has spent her whole life around animals of all species. Becoming a dog trainer was a natural course for her to travel. She finds it hugely rewarding working with both dogs and their owners that she meets along the way. Kyla McNeill, Certified Professional Dog Trainer, is very happy to have joined the Paus-n-Train team in the fall of 2018. Kyla is dedicated to helping dogs and their humans understand each other while creating a rewarding, lifelong relationship together. Kyla’s passion for dog training began when she was 8-years-old and her family adopted a high-energy, independent, Siberian Husky. This special dog inspired Kyla to begin researching and learning everything she could about dog training, putting it into practice with her own dogs as well as family and friends’ dogs. Kyla has previously worked as a dog walker, in a dog daycare, apprenticed with another trainer and assisted in training classes prior to becoming a full-time dog trainer. Kyla believes that continuing education is extremely important and strives to keep her knowledge and skills up to date by frequently attending and participating in seminars, workshops, and courses, both online and in person. Kyla has found that positive reinforcement and motivational techniques are the most effective way to train behaviours, while also creating great understanding in the dog, and fostering a strong relationship between dog and handler that is based on communication and trust. Kyla lives with her fur-family of three cats, a border collie, and two rescue dogs; a miniature dachshund and a wire fox terrier. Kyla greatly enjoys training and competing in the sport of agility with her border collie Niamh. Kyla and Niamh have competed in both Regional and National agility competitions. Kyla and Niamh also love being members of the performance dog team Woofjocks Canine All Stars. Kyla brings her great love of dogs, years of experience, and keen observation to her work with all breeds, sizes, and personalities of dogs. Jenilee Gobin is currently pursuing her PhD at Trent University in their Environmental & Life Sciences Program. Her research there focuses on evolutionary ecology: how animal traits are influenced by their evolutionary history, as well as their environment, and how these two things interact to determine future traits. Her interest in dog training began almost 4 years ago, with a very special 2½ year old Australian Shepherd named Beta. Beta was being retired from her breeder’s program after having two litters of puppies. Jenilee was aware when she adopted Beta that she was poorly socialized as a puppy and was reactive with unfamiliar dogs. What Jenilee did not know at the time, was that Beta would also turn out to be extremely fearful, reactive, and a bite risk with people. Being Jenilee’s first dog ever, she had really “jumped into the deep end”, as Gwen likes to say! Seeking help and advice on how to help Beta cope is how Jenilee first came to know Paus-n-Train, and herself was turned on to clicker and positive-reinforcement training methods. Jenilee has witnessed firsthand how dogs can thrive and flourish with the use of positive training methods, particularly sensitive and fearful dogs. Although Beta is an amazingly loving and loyal girl, she came to Jenilee having rarely been off her breeder’s property and without even basic obedience training. Using positive training methods not only allowed Jenilee to teach Beta basic obedience, and numerous tricks – it allowed her to help build Beta’s confidence and establish the trusting relationship with her that Beta needed to help her begin to cope with her fears. While Beta will likely never come to like or trust people or dogs she doesn’t know given her lack of socialization, she has come a long way and is now able to keep her brains in her head around the things she fears! She can now even practice agility in her backyard with the neighbour’s dogs barking at her, and no longer bears a strong resemblance to a Tasmanian Devil on a leash when walking past people on the street. Jenilee has since gotten a second Australian Shepherd, Rho, who is now 1½ years old, and is training in agility at Paus-n-Train. She hopes to one day be able to compete with him in both agility and disc. She has been apprenticing under Gwen Little at Paus-n-train for over a year now, assisting with and leading Dog Manners I & II classes. In addition to continuing on with dog training, she also hopes to be able to merge her current career path in scientific research with her passion for understanding and shaping dog behaviors, perhaps in the form of conducting research to help us better understand genetic and environmental effects on dog personality and behavior. Kim graduated with honours from Animal Behavior College. After completing her externship with Gwen Little at Paus-n-Train, she is now continuing to mentor under Gwen. 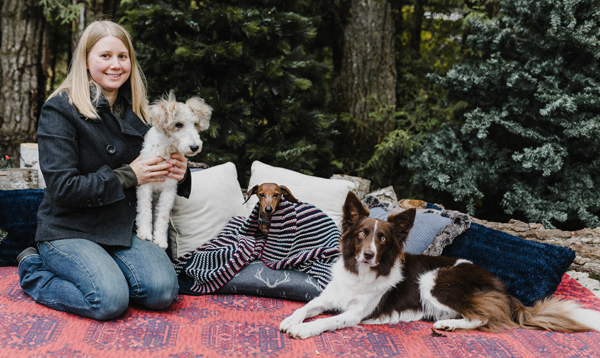 Growing up with dogs, Kim has always had a passion for training animals, and in her “rescue” mode, Kim has taken in cats, geese, ducks and a potbellied pig. However when she took in her rescue Rhodesian Ridgeback cross Copper, she truly started to understand the value of clicker and positive training. She recognized his dislike and fear of training sessions, so she knew she had to make sure they were all fun and positive experiences for him. This started her journey to becoming an Animal Behavior College certified dog trainer. She was able to see first hand how these positive reinforcement methods transformed Copper from a jumpy and somewhat confused dog into a confident and very well-mannered amazing family member. Kim takes great pride in her work and loves to see dogs (and their humans) succeed. She is committed to furthering her education through continuing education courses and she reads any training, behaviour, or dog book in general that she can get her hands on. Through her work at Paus-N-Train, Kim is working towards her CPDT. Kim also has a great interest in cars. Currently (and for the past 16 years) she is the manager of NAPA Auto Parts in Bridgenorth. In her spare time, she loves tinkering with engines and her old car. After being a synchronized swimmer for just over 20 years, she turned her love of the sport to coaching. She started coaching new swimmers on days she wasn’t in the pool herself teaching them the basics of synchro and quickly moved her way up to coaching the top team of the club. The precision required to swim at this level is very high and Kim learned all she could about advances in training and coaching so she could help her athletes reach their full potential. She always made sure her lesson plans were unique, challenging and yet fun for the girls. She sometimes had to be creative to keep her team motivated during 6AM practice! As a dog trainer, Kim is bringing with her the leadership and motivational skills she has honed over the years. I am a former teacher who gave up my chalk board to be a stay at home mom for my two children. Now that my kids are older, I am a proud “stay at home dog mom”. I have lived with animals all of my life and have had numerous types of companions such as ferrets, sheep, ducks and hedgehogs. I competed and trained horses for over 20 years in the hunter/jumper ring, both provincially and nationally. When my last show horse, Bentley, pulled his stifle and couldn’t jump anymore, I decided to switch my focus to dogs. I always loved watching the dogs perform at the Royal Winter Fair, so I decided to give agility a try. I purchased Daisy, an Australian Shepherd, and have never looked back. In addition to Daisy, I also have a Miniature Australian Shepherd named Chase that I compete with. Both Daisy and Chase have competed at provincial and national events. We’ve also tried flyball and dock diving. My canine family also includes a Miniature Dachshund named Slinky, a Husky cross named Spirit, and my newest addition, Triumph a Miniature American Shepherd. All my dogs also perform with the Woofjocks Canine All Stars, a demo team that uses positive training methods to showcase our dogs’ talents and abilities.